Finding breakfast in Thimphu is a challenge. Seasons Pizzeria used to have some breakfast items on their menu, but the last time I checked the items were removed. 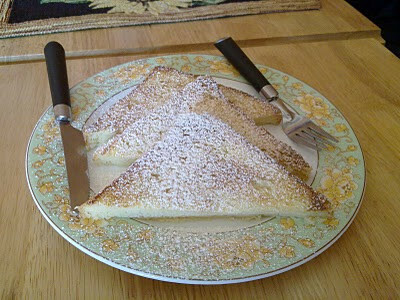 So it was a nice surprise today to find a new item on Big Bakery's menu: French toast. The menu was recently revamped by Yoko san, the bakery's new pastry chef. When you order Big Bakery's french toast you'll get three warm, thick slices of the bakery's Pullman bread, dipped in milk and egg, gently fried and finally dusted with confectioners' sugar. The damage: only Nu 30. Quite possibly the best value in town, and a delicious and inexpensive way to start your morning.